Home » Blog » How far does your produce travel? In most cases, the farther your produce travels the less nutritious (and tasty) it is by the time you eat it. Even though the grocery store appears to have a wide selection of produce, their focus is truly on varieties that will travel well and have a longer shelf life. Needlessly transporting produce all around the globe wastes natural resources and harms the environment. So after learning that organic carrots from a local farm (that were pulled out of the ground yesterday) might be more nutritious for my family than carrots from the grocery store I decided to start visiting our local farmers’ market. I want to share a thing or two that I learned about buying food locally, but before I do I encourage you to find a farmers’ market in your area through the Local Harvest website. This website can also help you find a local farm that offers a CSA (Community Supported Agriculture) box which allows you to become a member of that farm and receive a weekly box containing produce that they have selected for you. In regards to farmer’s markets, I first learned that there are different types. The type that I have become fond of is a “growers-only” market, and luckily the largest and most diverse growers-only farmers’ market in the Charlotte area is fairly close to us – the Matthews Community Farmers Market. I also visited the much larger Charlotte Farmers Market and quickly got the impression that the people selling the food there weren’t the ones that actually grew it, and a lot of what was offered was not organic or grown locally (including some berries I saw from South America). There were a few local items mixed in, but other than that I felt like I might as well have gone shopping at the grocery store. The Charlotte Market may have a higher quantity of local items once summer nears, but during the time I visited it was definitely a different feeling from the Matthews Farmers Market. I also learned that if you are planning to hit a local growers-only farmers market like the one in Matthews (especially in the winter) you really need to get there right when it opens – hello 7 A.M.! I learned this the hard way and showed up towards the end the first couple of times only to find that the farmers hardly had any produce left! This was also during their “winter market” when high quantities of local produce are a little harder to come by. So I finally figured out that I must set my alarm on a Saturday morning to try to get there at least close to when the bell rings – yes they actually have a bell to signal the start of selling time! And before the bell even rings there are already lines of people waiting at their favorite booths. Here is a picture of some of the things I was able to get this past weekend. Which leads me to my next point…you must be a little adventurous and willing to try new things because the farmers are basically only selling what’s in season in your area. Trying new recipes with your newly discovered produce can be fun and keep things interesting. Over the last month or two I have tried both rutabagas and collard greens – both items I don’t ever recall eating before, but that is what is fresh and in season here right now. I still can’t live without my organic berries in my granola cereal every morning, but the best thing we can do for ourselves, for our environment, and also for our local agriculture is to try to add as much locally grown produce to our diet as possible. As you can see in my picture, in addition to produce some of the farmers also sell eggs, cheese, grass-fed beef and other locally & humanely raised meats. 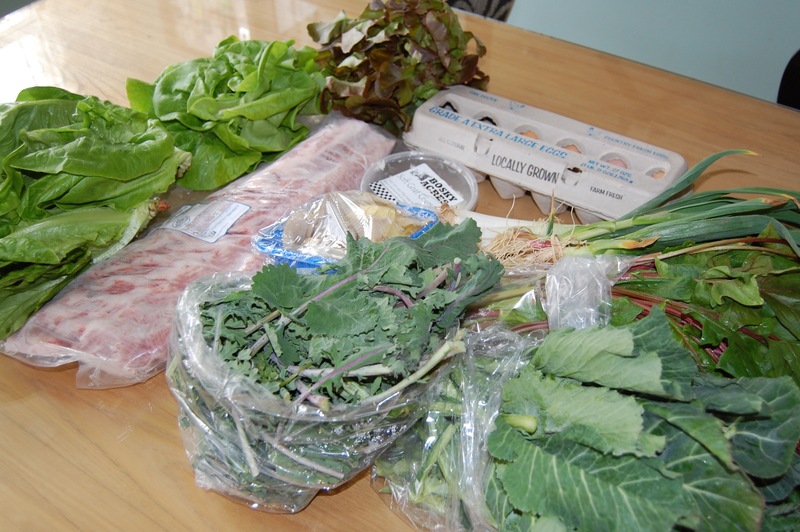 We have really enjoyed this new food shopping experience and since we aren’t really morning people we decided to sign up for an every other week CSA (from Poplar Ridge Farm), starting in May. I love the idea of a big box of fresh, healthy, local and organic produce that has been reserved just for us! Previous Post: « What (should be) in your sandwich bread? Hi Dr. Merritt! Thanks so much for visiting my new blog – I just started it last week! Cutting out processed foods has made such a difference in our lives that I just wanted a way to share it with others! And I think you must have cured me or something b/c my back has felt great. I haven’t felt like I needed any chiropractic care at all, but if I do I will definitely come back to you! Also, I think you work downstairs from my neighbor Dr. Susan Ladd. I love your blog. I stumbled on it with a tag search on Community Supported Agriculture. I like your pragmatic style and think it will resonate really well with sensible moms. Thanks for the post. I’m a big CSA fan. I really like your blog, extremely informative! Great article, I hope for the updates. Nice blog,, Great article, I hope for the updates. Reply whenever thereâ€™s updates! where i can join your community like Fb or Your Twitter??? thanks, nice TerGapteK ya. The simple truth is, a person who is usually uncooperative may be silly, unyielding and tough to manage. All those all over him / her can seem to be exasperated and helpless, specifically that person would be the person and / or boss in the internet business. Purchasers might possibly chuckle over it versatile individuals may possibly see the resistance as being silly and narrow-minded. vous pouvez obtenir suite coupon rabais Ã l’aide codes. Vous choisissez sÃ©lectionner votre revendeur ou sÃ©parÃ©s source certains dÃ©duction codes afin que vous puissiez obtenir un diminution, patrimoine ou engagÃ©s d’affaires. Vous aussi quelqu’un Ã votre disposition exploit une liste oblique ressemblance code avantage shopping, clair produits, coupons, diminution impression, dÃ©gagÃ© jeux et concours, un adsl comparative, talent et gogo autres haut offres . I’ve been browsing on-line more than three hours these days, yet I never discovered any fascinating article like yours. It’s pretty value sufficient for me. In my opinion, if all site owners and bloggers made excellent content as you did, the net will be a lot more helpful than ever before. If you put a photo in this post that would show up better on pinterest you would get more pins. This is a great post. One thing I didn’t see you mention here, though you probably have mentioned it in later posts, is stocking up and storing for the coming year. You love your organic blueberries? pick or buy in a large enough quantity when they are in season and can or freeze to last you. My family loves strawberries, so yesterday we went and picked 25 lbs. Probably won’t last this family of 7 for the year, so we’re hoping to go again Tuesday and get that much again if the harvest holds out. I stock my freezer with venison in the freezer, berries and fruits in the summer, vegetables as they are available. So tasty. I just wanted to say that you have a beautiful and extremely resourceful site. I look forward to exploring all that it has to offer. I’ve been a whole-food vegan since January and will never go back. Plant-based has empowered me to be a healthier, stronger, and more energized person. Carrageenan mostly in dairy is harmful to the intestinal track. I love our Green Bean Delivery every other week. It’s too overwhelming (for me) to figure out what’s in season, where it’s at, and how to use it. With the bin, I just gotta figure out what to do with it. So I’m wondering, and I apologize if you’ve commented on this before, but would you recommend buying the organic bell pepper from Mexico or the non-organic one that is sourced “locally” which I understand from Kroger (our local grocery chain here in Ohio) is within 400 miles? Hi Elizabeth. This is often a tough question to address. However, since bell peppers are on the dirty dozen list for heavy pesticides, I would choose organic over “local”. You have a great point, but our growing season is only from May to October. With you living further south it is much easier for you to get fresh produce from a Farmers Market all year round. So yes, I buy organic veggies from the grocery store and who cares if they are not as nutritious. You do heat you can do with the growing seasons in your area. We are still eating clean.